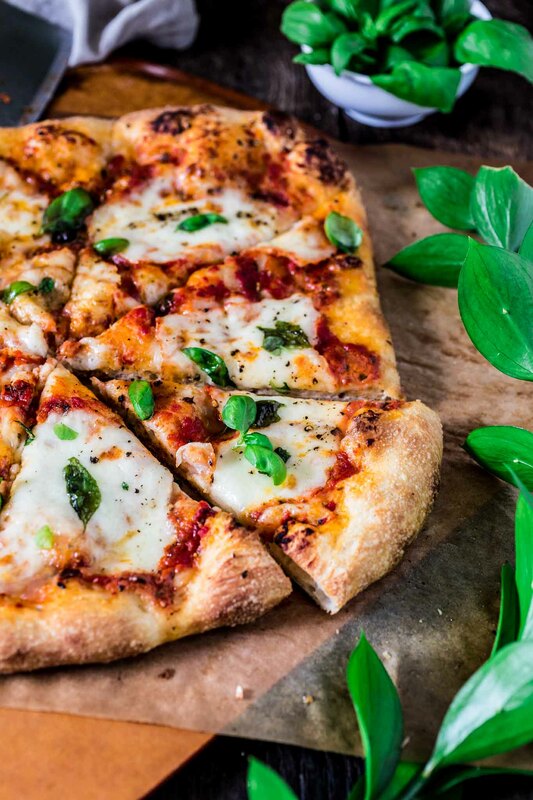 Are you a Pizza Margherita lover? If yes, have you tried making your own? A handful of simple, fresh ingredients (plus a jar of delicious Mezzetta pizza sauce) are all you will need to make this iconic pizza from Naples! Making pizza is one of my true pleasures in life. I love absolutely everything about it: from combining water, yeast and flour and seeing that become a being of its own, to topping the dough with fresh and creative ingredients as if I’m painting a blank canvas that is meant to be eaten. Oh yes, I feel good just by talking about it. It is truly therapeutic! ? I dare to say that everybody should know how to make Pizza Margherita by the time they’re in their 30s. Most supermarkets sell pizza dough (or you can buy from your local pizzeria), so you can’t even use the excuse of not wanting to make the dough from scratch. Because, seriously, who would prefer to order delivery over making something this beautiful? Invented in Naples, the Margherita Pizza is loved all around the world because of its simplicity. According to popular tradition, it was invented in 1889 by the Neapolitan chef Raffaelle Esposito, of Pizzeria Brandi, in honor of Queen Margherita of Savoy, who was visiting with her husband, King Umbero I. It was garnished with tomatoes, basil and mozzarella cheese, in order to represent the Italian flag. Raffaelle named the pizza after the Queen and asked only to put the royal seal on his pizzeria. The Queen wrote him a thank-you note, one that hangs on the wall of the Pizzeria Brandi (which his descendants still own) to this day. Or at least that’s the story. Descriptions of a similar pizza can be traced back to at least 1866 in Francesco DeBouchard book “Customs and Traditions of Naples”. There he describes the most popular pizza toppings of the time, which included one with tomato and basil, often topped with slices of mozzarella. Was the whole thing a farce? God knows! There are several studies online dedicated to proving that Raffaelle lied about the whole thing and even saying that the thank-you letter from the Queen is fake. Ooooh, drama! Who doesn’t love a good drama? If this would have been in recent times, Raffaelle would probably be the cover of a gossip magazine. Since it was a long time ago, when the Internet didn’t exist, Pizzeria Brandi became really popular, attracting tourists (curious to see the infamous letter) to this day. 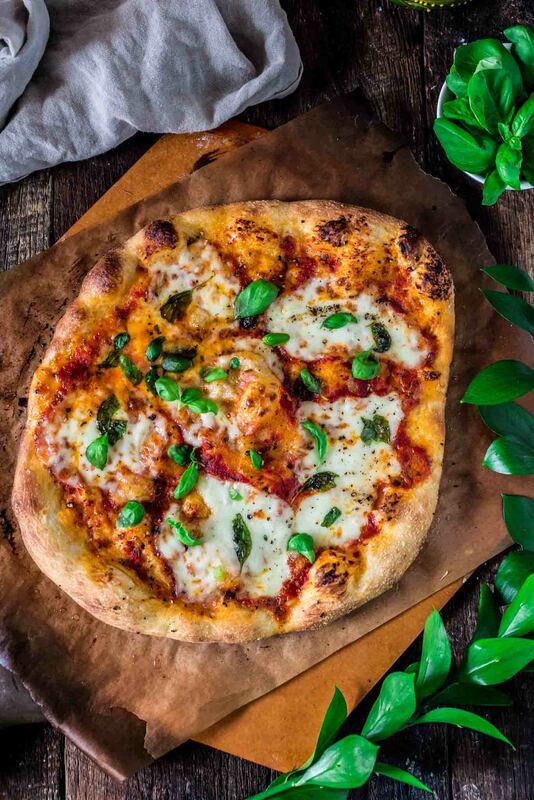 Whatever the real origins of Pizza Margherita are, we can’t deny that this pizza is one of the most recognizable symbols of Italian food culture in the world, as well as one of the most delicious pizzas of all times. And that was your daily dose of food history! Hopefully you’re as much as a food nerd as I am and appreciate a little food tale. ? If not, I hope you can at least acknowledge that there’s just one reason this pizza has not only survived all these years but also became an icon: it is truly delicious. And the best thing is that it is VERY EASY to make at home! Now, I told you before (ages ago, at the beginning of this post! ?) that I really enjoy the pizza making process. So every now and then, I will make my dough and sauce from scratch and spend a long time in the kitchen, savoring every step along the way. Does that happen every time I want to eat homemade pizza? Hell no! Imagine having to wait for the dough to rise and proof while I’m craving Pizza Margherita. That, right there, is the modern definition of torture! Ok, not really… But, c’mon! You do get my point, don’t you? So today, since I am talking about pizza, I am very grateful for two things: pizza dough from Whole Foods and Mezzetta Pizza Sauce. While I could make those things from scratch, I am glad that I can find high quality brands that do all the hard work so I don’t have to! Mezzetta is truly a brand that I endorse with all my heart, especially their sauces. Simple, rich, fresh and made with the world’s best tomatoes, hailing from the rich soils of Italy’s San Marzano region. If you’ve read just a bit of Italian cooking, you know San Marzano tomatoes are ALWAYS the way to go! And speaking of Italy and San Marzano tomatoes, what if I told you that you could win a trip (for you and a guest) to attend culinary experiences in the San Marzano region of Italy? Does that give you goose bumps? ‘Cause it totally gives me the chills! If that sounds like a dream come true, enter here for a chance to win this away giveaway hosted by Mezzetta. Once you have your dough and sauce – either homemade or the brands recommended above – your pizza should be ready in about 10 minutes. Yes, seriously! That is quicker than dialing the pizzeria number and placing an order, let alone waiting for that order to arrive. If you don’t believe me, just watch the video below to see how simple and easy it is to make Pizza Margherita. Remove dough from refrigerator and let come to room temperature in an oiled bowl, for at least one hour. Preheat your oven to 550F, or higher, for at least 30 minutes. If you have a pizza stone, place it in the lower-middle of your oven. Dust your counter with flour. If making two pizzas, divide your dough in half and cover one of the halves with a kitchen towel while you prepared the first pizza. Using your hands, stretch and shape dough into a 20-inch circle (if making one pizza) or 10-inch circle (if making two pizzas). Transfer the dough to a sheet of parchment paper and use your hands or a rolling pin to reshape it, if necessary. If the dough starts to shrink back, let it rest for 5 minutes and then continue rolling. Brush olive oil and season the dough with salt and pepper to taste.Then, spoon the pizza sauce onto the dough, leaving a 1-inch border. Top with the cheese and some basil leaves, drizzle more olive oil and season again with a little salt and pepper. Using a pizza peel (or the back side of a baking sheet), transfer the pizza to the pizza stone. If you don't have a baking stone, bake the pizza right on the baking sheet. Bake until golden brown, about 6 to 8 minutes. Slide the parchment back onto the pizza peel (or back side of a baking sheet) and transfer to your counter. Top with fresh basil and drizzle more olive oil (if you'd like).Repeat with the second dough, if making two pizzas. I love this recipe Olivia, looks so tasty and the video is really well done and entertaining. Nice job! Thank you, Silvia! I loved making this video (and eating the pizza afterwards! lol). Somehow it’s always the good ol’ classics that make me drool the most. Ehem, this pizza. I cannot wait to make this for lunch this week!! That was such a joy to watch. Like you, I’m a fresh made pizza lover as well. Beautifully done my friend. Oh!, by the way, if I win, I’ll take you along. nothing beats a classic! this looks so good! Thanks, friend! It was very good indeed! Yes and yes. This would do me right now. Classic and those crispy edges. Perfect Olivia. Dave is not a big fan of tomato, but I am and would devour this. Oh no, Dave! Tomatoes are delicious. lol My mom doesn’t like fresh (or cooked) tomatoes either, but she doesn’t mind tomato sauce.